How to Check Your Car Wheel Alignment? Wheel alignment is a complex topic, when your wheels are out of alignment, your tyres aren’t pointing in the right direction. This will affect your steering and suspension, but more importantly, it could affect your safety and the life of your tyres and all the parts controlling them. How do vehicles lose their wheel alignment? There are many ways for your vehicle to lose its alignment. 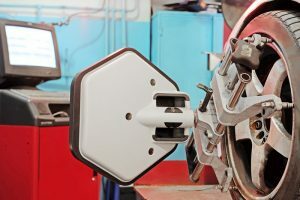 You will probably know most of the causes, but what you probably didn’t think was that each one could do quite a number on your vehicle’s alignment. Fair wear and tear — as vehicles age, rubber components start cracking or lose their elasticity and ball and socket joints develop looseness. They start to give a little more, progressively getting slightly worse over a period of time. Alignment angles are measured in tenths and hundredths of degrees or inches. Over time, a slight misalignment can cause a lot of uneven or premature tire wear. How can I tell if my vehicle’s alignment is off? Wheel alignment ensures optimal drivability. It will extend the life of your tyres, your vehicle will drive smoother, ultimately keeping your wheels pointed in the right direction. When your vehicle’s wheels are correctly aligned your vehicle requires less energy to keep going thus using less fuel and becoming more economical. All new vehicles leave the factory with preset alignment and special angles that position your tyres correctly on the road allowing your vehicle to travel the way it’s supposed to. Misalignment can lead to uneven tyre wear, poor handling and shorter tyre life. Tyres are expensive. Keeping them aligned isn’t. We recommend an alignment check with every other oil change. A lot happens over the course of 6,000 miles. You drive through pot holes, travel down gravely stretches of road, or worse, knock your wheels on the curb all these things can impact the way your tyres sit, throwing off alignment in an instant. The longer you wait for an alignment, the more damage that can occur, If it’s been awhile since your last alignment, it’s time for a checkup. Every model that rolls off the assembly line has unique alignment specifications. Alignment specifications are determined by the vehicle manufacturer for each make and model. The size, length, weight and intended use of the vehicle all play a role in the determining the correct alignment angles. Why is it so hard to determine if my car’s alignment is off? It’s not you, it’s your eyes. We mere humans can’t see in fractions of degrees without technology. It only takes a minuscule amount of misalignment to have a huge impact on tyre life. So, signs and symptoms of poor wheel alignment, unfortunately, aren’t always right there staring you in face. How is alignment different today?